My mind is racing in a million different directions today. As usual, that translates to me wandering around the house wondering exactly what I should do first. I don't seem to be very good at being busy anymore. So. 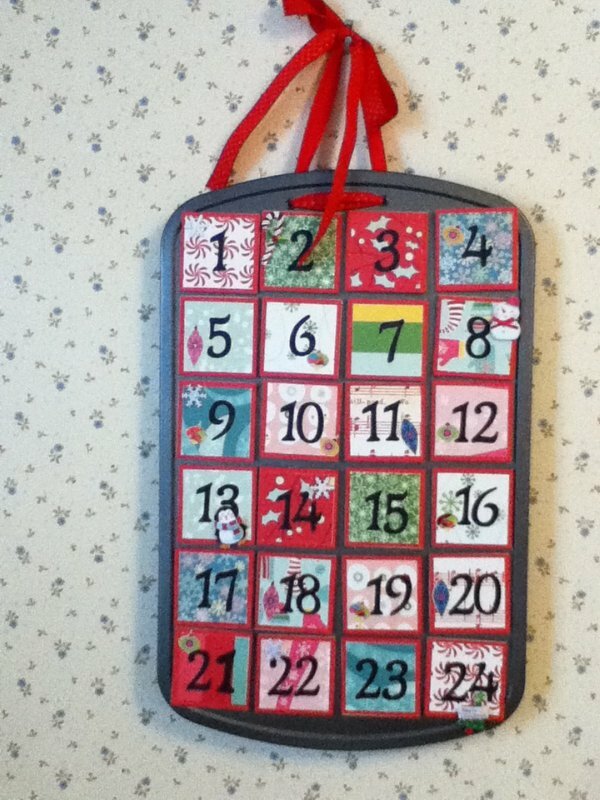 Are you all as smitten with advent calendars as I am? Judging from the number of round-ups I'm seeing in blogland, I'm going to assume: yes. I know Jessie shared a fab calendar with us last month as part of the Handmade Holiday series, but today I wanted to share one that my mom made for us. So simple, and so cute. 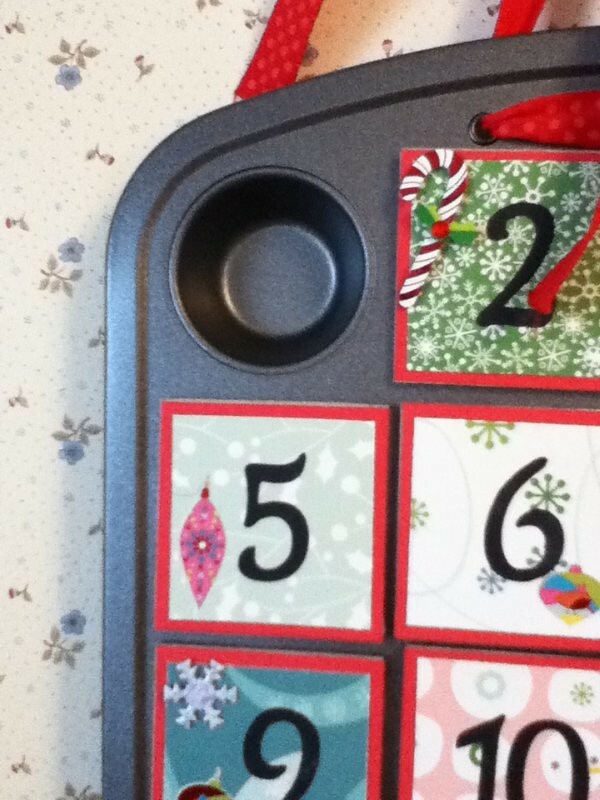 The thing that makes this advent calendar so rad is that it is made with a mini muffin tin(I like this one ). That way I can use it the 11 months out of the year that it isn't busy being a calendar. It also makes it easily adaptable for other holidays or events such as birthdays or the end of school. Behind each chipboard square (that is held on with magnets) there is a piece of candy and small activity to help us get ready for Christmas. Today's activity is to write a letter to Santa. In case you're wondering, we're still very much wanting a Pillow Pet here. I think it is so fun that Z-cakes is old enough to have an opinion about what she wants for Christmas. I am so excited to experience the magic of Christmas with a two-year-old in tow. :: If you're still hunting for activities for your advent calendar, I've always been a fan of Jordan's list. :: Now that it is December 1, I am officially listening to Christmas music. I'm starting a brand new Christmas station on Pandora today! :: I've been wanting to knit this for ages. Maybe next year. Do you think it is silly to fill your house with advent calendars? :: I'm making these for dinner tonight. Care to join us? :: I spent yesterday evening digging out our car and clearing a path in the sidewalk. In the amount of time it took me to don a touk and snow gloves, I was done pouting about the weather. Now I'm happy to be out in the gorgeous snow. Which is good. Because it's snowing again today. And tomorrow. And the day after that. :: Have you heard about Pinterest? Oh dear, I think I've found a new way to spend an enormous amount of time on the internet. If you've already joined let me know so I can follow you! That should do it for now. Wishing you a wonderful December One! I absolutely do not think it is crazy to have more than 1 advent calendar. We have 4 at our house. 2 for chocolate and 2 for ornaments for a little christmas tree that correlates to a story that we read every night instead of our usual scripture study. Just another reason why December is so special! And if you have more than 1, then the kids don't have to fight over whose turn it is to unveil the secret of the day! Advents are everywhere aren't they, I am a culprit of the advent round up too! Love the idea of your one as it is usable all year round, like you say. I couldn't resist the snow either today and tucked up and hand a run through the garden! Oh and don't search 'Christmas' on Pinterest unless you have hours and hours to spare!! I am becoming addicted! OK - that hat and mitten advent is too cute. If only my boys wore the knit variety - I could use their nonlost items and make my own. Hmm. That mini muffin tin advent calendar is genius! Hello, love! Will we be seeing you around during the holidays? We had so much fun this morning putting on the first ornament of our advent tree and, of course, the chocolate advents that my mom bought for the kids...highlight of the morning. Seriously, who doesn't like 24 days of chocolate for morning snack? So much goodness here. I love advents, I don't think it is silly to have multiples! The knit one is genius. I'm a little scared of Pinterest - I already spend too much time on the computer! I LOVE the muffin tin advent. So I whipped one up yesterday. Well, it was only a 12 muffin tin, so we are just going to do 12-days until christmas countdown. Can't wait. Thanks for the idea!